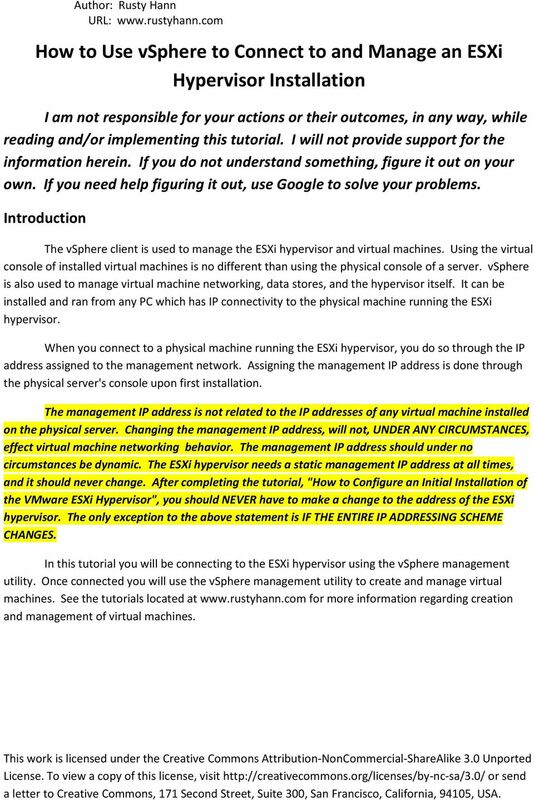 Download "How to Use vsphere to Connect to and Manage an ESXi Hypervisor Installation"
1 How to Use vsphere to Connect to and Manage an ESXi Hypervisor Installation I am not responsible for your actions or their outcomes, in any way, while reading and/or implementing this tutorial. I will not provide support for the information herein. If you do not understand something, figure it out on your own. If you need help figuring it out, use Google to solve your problems. Introduction The vsphere client is used to manage the ESXi hypervisor and virtual machines. Using the virtual console of installed virtual machines is no different than using the physical console of a server. vsphere is also used to manage virtual machine networking, data stores, and the hypervisor itself. It can be installed and ran from any PC which has IP connectivity to the physical machine running the ESXi hypervisor. When you connect to a physical machine running the ESXi hypervisor, you do so through the IP address assigned to the management network. Assigning the management IP address is done through the physical server's console upon first installation. The management IP address is not related to the IP addresses of any virtual machine installed on the physical server. Changing the management IP address, will not, UNDER ANY CIRCUMSTANCES, effect virtual machine networking behavior. The management IP address should under no circumstances be dynamic. The ESXi hypervisor needs a static management IP address at all times, and it should never change. After completing the tutorial, "How to Configure an Initial Installation of the VMware ESXi Hypervisor", you should NEVER have to make a change to the address of the ESXi hypervisor. The only exception to the above statement is IF THE ENTIRE IP ADDRESSING SCHEME CHANGES. In this tutorial you will be connecting to the ESXi hypervisor using the vsphere management utility. 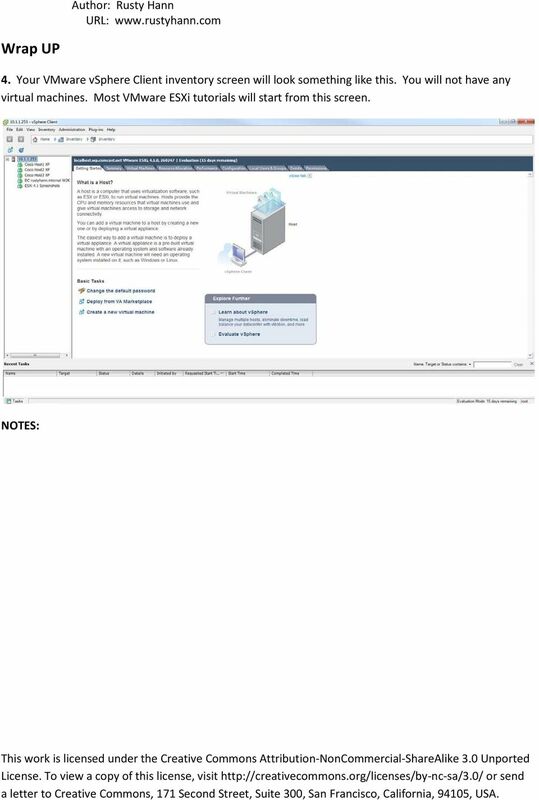 Once connected you will use the vsphere management utility to create and manage virtual machines. See the tutorials located at for more information regarding creation and management of virtual machines. 2 Steps 1. Double click the VMware vsphere icon to start the vsphere program. You can also start the vsphere management console by going to Start Menu -> All Programs -> VMware -> vsphere Client. 2. Enter the IP address of the ESXi hypervisor. 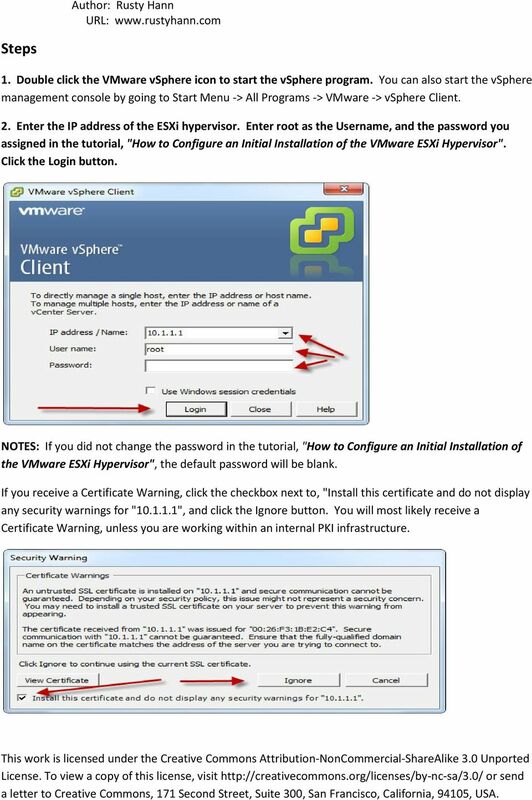 Enter root as the Username, and the password you assigned in the tutorial, "How to Configure an Initial Installation of the VMware ESXi Hypervisor". Click the Login button. NOTES: If you did not change the password in the tutorial, "How to Configure an Initial Installation of the VMware ESXi Hypervisor", the default password will be blank. If you receive a Certificate Warning, click the checkbox next to, "Install this certificate and do not display any security warnings for " ", and click the Ignore button. You will most likely receive a Certificate Warning, unless you are working within an internal PKI infrastructure. 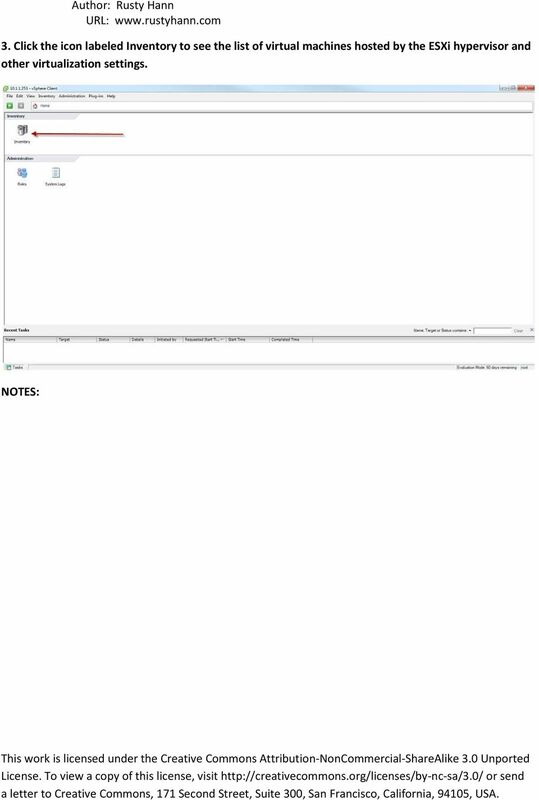 5 Troubleshooting Author: Rusty Hann If you do not have IP connectivity to the physical server running the ESXi hypervisor, you will not be able to connect with the vsphere client. You must have ping in order to connect. I am not responsible for your actions or their outcomes, in any way, while reading and/or implementing this tutorial. I will not provide support for the information herein. If you do not understand something, figure it out on your own. If you need help figuring it out, use Google to solve your problems.